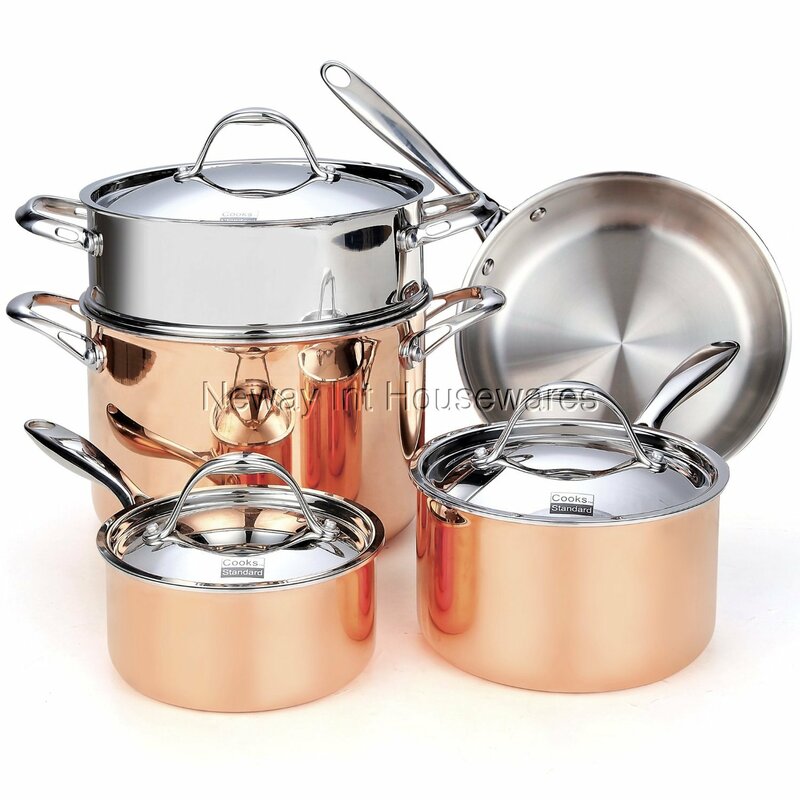 The Cooks Standard 8-Piece Multi-Ply Clad Copper Cookware Set includes: 1.5 quart covered saucepan, 3 quart covered saucepan, 8 quart covered stockpot, 10-inch open skillet, and a stainless steel steamer insert that fits in 8 quart stockpot. What is Multi-ply clad copper? Multi-ply clad construction is a combination of 18/10 stainless steel interior with am aluminum core and exterior polished copper. Copper is an excellent material for heat conductivity. Professional chefs like to use copper cookware to have precise heat control for perfect cooking performance. Copper exterior looks elegant, however copper is very sensitive to the oxygen in air. May tarnish even when not in use. When heating cooper cookware, discoloration may happen faster. Regular polishing is needed even when not in use. Not Dishwasher safe, wipe dry immediately. Water residue on surface may stain and tarnish cookware. Cleaner product such as Bar Keepers Friend is recommended to polish and restore the shine of copper.